Choose the team with MORE EXPERIENCE than any other regional health care provider. Thank you for your interest in scheduling an appointment with the UC Brain Tumor Center. Please fill out the contact form below, and a member of our team will contact you within one business day to set up a consultation. When it comes to your health, experience matters. The team at the UC Brain Tumor Center treats, on average, twice the amount of patients as any other hospital in the region. And to ensure the best possible treatment strategy and outcome for our patients, we begin with an analysis at our weekly Tumor Board – a meeting that enables us to take a team approach to the medical and surgical treatment of all brain and spinal tumors. Coupled with access to innovative clinical trials and the most advanced research performed in the field of Neuroscience, the UC Brain Tumor Center is dedicated to providing compassionate expertise and exceptional patient care. The center has performed more than 2,000 brain tumor surgeries in the past five years. Its experience in radiation therapy is unmatched in the region, and our physicians are recognized as “Top Doctors” locally, regionally and nationally. Three out of four brain tumor patients in the region are treated by our multidisciplinary team of specialists. As an academic health system, we are the only institution in the region that performs adult transitional brain tumor research. Overall, the center has dedicated nearly $10 million to brain tumor research within the past five years. 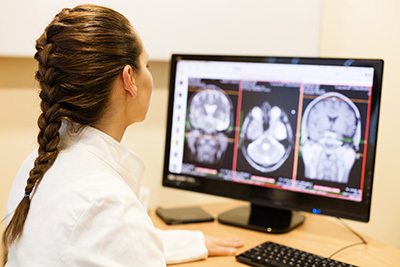 Our team evaluates every patient at the comprehensive Brain Tumor Board. This Tumor Board provides reassurance to local patients as well as those who consult us from a far. Our patients have access to new and innovative treatments through our clinical trials program, as well as other clinical research through our involvement in the Ohio Brain Tumor Research Study. Our patients have access to proton therapy, a type of radiation therapy that can target tumors with pinpoint precision without damaging healthy tissue. Our proton therapy center is one of only 23 centers of its kind in the country and houses the world’s only treatment gantry (radiation treatment room with a moveable beam) exclusively dedicated to research. 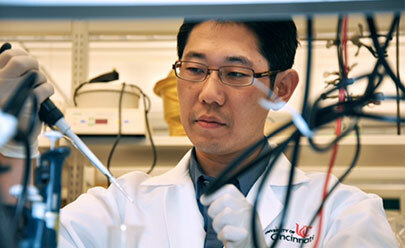 Most important, 93 percent of UC Brain Tumor Center patients would recommend our services to their family and friends.